Those playing tennis at the courts in town have probably noticed the pavilion being built over the past year. However, most students have not realized that it has been their peers, other students, building it. The construction trades class offered at RTI built it, and the masonry class is currently brick veneering the pavilion. The masonry class does projects throughout the community often, but the students do not have to enter the class being able to do large scale jobs. “Almost 95 percent of my students come in and have never laid a brick. The first thing I do is teach them the very basics of handling their hand tools and spreading mortar. The first couple weeks of school we learn how to make mortar and spread it before they lay brick. When they can lay brick, we move on to setting brick and laying it level and straight,” masonry teacher Rick Pilkenton said. Then the students move onto learning how to work with blocks, allowing them to learn both brick and block within the first month of school. Through the fast paced environment, Pilkenton is sure to include what he feels is one of the most important aspects of the class. “We learn how to be employable first and foremost. A lot of students come in and want to be bricklayers and that is great but the biggest thing I push is being employable,” Pilkenton said. Being employable means teaching work ethic, taking responsibility, and being able to work with others on large projects. These projects include residential as well as commercial work within the community. “Every other year the carpenters build a tech house and our curriculum that year is to brick veneer the entire house. It is a full masonry home so it is usually about 13,000 bricks and takes us most of the year to get that done,” Pilkenton said. On the off years the class completes jobs throughout the community and school district, such as the tennis court pavilion. Upcoming projects include a storage building for Rolla school district and a sign for a subdivision. “I always try to have real life jobs for them so they can have real life experiences,” Pilkenton said. When building these houses, signs, or other projects, Pilkenton allows his students to be involved in every aspect of the process. For the houses, they begin with choosing the kind of brick. “On this tech house we have coming up we are going to do a brick with stone mixed in. We get to figure out how to combine those two products. As far as the learning side, we have to lay out walls and figure out material to know how many bricks and stone it will take. I teach them how to flash a foundation to keep water out of the house and they learn how to tie the brick to the structure with wall ties. It covers everything they need to know for residential work,” Pilkenton said. On the commercial side of the job, they will be learning more during the building of the block storage building. The students will learn more about making a building strong enough to hold the weight of the roof among other things. Pilkenton teaches both sides of the job in order to help his students be more employable and ready for an entry level masonry job. While he estimates about 10 percent of his students go into the actual masonry field, many come back to tell him they have gone into the construction or welding field. Some go onto college and do masonry as a side job to make extra money. 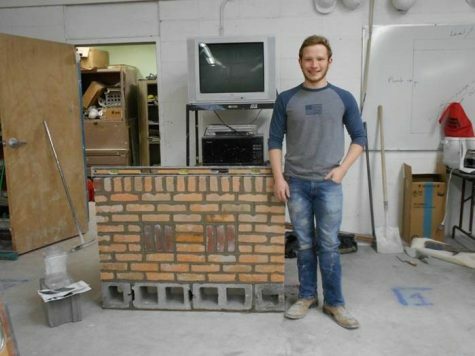 Although most students do not necessarily have a finalized career path in mind by sophomore year, Pilkenton assures that the class is beneficial whether one pursues masonry or not. He stresses the importance of what the RTI offers and how these career paths are necessary. “The industry is lacking in skilled labor in all the fields. The workforce is getting older and older and not enough young people are there to replace the older generation that is building right now. It is crucial that we recruit enough young people to keep the industry going. We have to have people to build houses and all of our structures. We need carpenters. We need plumbers. We need electricians,” Pilkenton said. All of those careers are offered as classes at the RTI, students just have to take the class for two years. Pilkenton attests that the schooling is worth the wages offered. “The average wage for the Rolla area is $53,000 a year. I know a lot of people making well above that here locally. I know several foremans that are pushing $100,000. The money is right. You just have to have the young people willing to get into the trade,” Pilkenton said. If young people do want to join the trade, they can take masonry classes as juniors and seniors. “All they need to do is as a sophomore go talk to their counselor and get signed up for RTI. I would be more than glad to have them. They need to know that I don’t expect them to be bricklayers, we are just learning work ethic and how to be employable,” Pilkenton said. Though he has never had a student not like his class, he is welcoming to anyone unsure about it to come job shadow. “I suggest that sophomores go talk to their counselors if they are serious about it. I would be more than willing to let anyone come over for an hour or for the day as long as it is cleared by the school,” Pilkenton said. He believes wholeheartedly in the trade and hopes for more students to join in the projects across the community. “Masonry is a dying breed that is an awesome trade. I’d like to see us make work cool again. Work is so rewarding when you can make something and be proud of it. Masonry would definitely put you in that position,” Pilkenton said.